Not everyone can be an international superstar. But Saul “Canelo” Alvarez might just be. Already a superstar in Mexico and a star in the US, Canelo looks to test both his skills and his selling power in his return to action following his high profile loss to Mayweather Jr against Alfredo Angulo this Saturday night. A huge man for the 154lbs division (with his fight night weight having been recorded at the high 170’s for some bouts), Alvarez had shown power and excellent combination punching as he was moved through the ranks. There were (rightfully) grumbles that despite having a 40+ bout record there was a lack of depth or real opposition there with most of the notable names having an asterisk by them; too old, too small, too rusty. Those grumbles were lessened somewhat with Canelo’s career-best victory over the awkward spoiler Austin Trout but there is still some truth to the argument that Alvarez’s reputation exceeds his results and it was his telegenic persona and star power in Mexico rather than his ability which had led to him being given the opportunities he had. But Alvarez does still have skills. At 23 he’s still at the age where he improves with every bout and one can easily see that transition from the somewhat robotic boxer/puncher we first really saw in the US against Baldomir and Jose Miguel Cotto to the fluid combinations he displayed against Josesito Lopez to the more defensively nuanced performance against Trout. Yes, he looked awful against Mayweather but quite frankly so do the vast majority of boxers and if that loss hasn’t broken him mentally then he will have learned from it. Angulo may never have had the chance to be a superstar in the mold of Alvarez but he did have a chance to be a star in an empty 154lbs division. Unfortunately much like his peer (and past opponent) James Kirkland, Angulo managed to shoot his own career in the foot, in his case with his immigration status. Angulo lost two years of his prime either in Mexico or in an immigration centre when he should have been headlining major shows and at 31 and coming off a loss, this is likely one of his last chances to really make a name for himself as a boxer. Despite being a come-forward pressure fighter, Angulo doesn’t throw the number of shots you’d expect someone with that style to do. Instead he picks his moments, relying on accuracy more and volume and timing more than pure aggression. At his best there’s a certain chilling relentlessness about the way he stalks an opponent down and how each punch seems to break them a little more. At his worst he can appear aimless, desperately following around an opponent who can hit, move and avoid being hit back. Both boxers have certain questions hanging over them going into this bout. During some the mid rounds against Mayweather Alvarez looked utterly lost and confused and at times he appeared to be completely mentally broken. The first loss can be a really big issue for boxers, especially ones who thrive on confidence and a certain amount of arrogance. Canelo could once rely on the invincibility of youth… but no he knows he is mortal, that he can lose. Will his mindset hold up? Or will he crumble as the unrelenting Angulo comes at him time and time again? While it doesn’t impact on the bout itself, it’s also worth noting that Canelo’s starpower is very much on the line here. This is his first PPV as the main attraction (as opposed to being opposite Floyd) and while there is a fairly strong undercard it’s not an undercard littered with well known names. Golden Boy have invested a lot in Alvarez and they want to see a return; a relatively impressive number of buys and he’ll be back on more PPVs, a disappointing number and he’ll be headlining Showtime cards instead. As for Angulo, the questions over him are more physical. At 31 he should be in his prime but two of his last four bouts have been absolute beatings; first against Kirkland where after a round of the year in the first it soon descended into Kirkland treating Angulo like a heavybag before mercifully being stopped in the sixth. Against Lara Angulo found some success and the bout was a war… but in the end it was Angulo who had his orbital bone shattered and his face rearranged. I don’t think the pattern of the bout will be that hard to predict. Angulo is going to come forward and look to land to the head and body. Alvarez is going to try to stand his ground but pick Angulo off at range, forcing him back with his jab and straight before using combinations when Angulo does get into the pocket. In the end I think Canelo’s great size, accuracy and punch selection will tell. 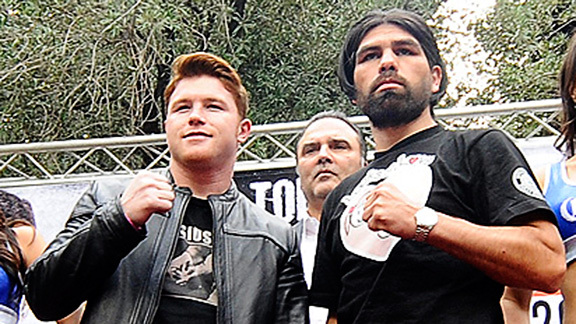 Angulo will have his moments but Canelo will make him pay before and after each one. It will be enjoyable to watch but in the end I think Canelo takes either a wide decision or a late stoppage. This entry was posted in Analysis, Boxing and tagged Alfredo Angulo, Analysis, Boxing, prediction, Saul Alvarez by consortium11. Bookmark the permalink.